We told you the experts expected this 1967 Ford Mustang Shelby GT500 Super Snake prototype to sell for well over a million. No one predicted it would bring in a record $2.2 million. One lucky buyer just paid $2.2 million to buy the car that collectors dream about. A true one-of-a-kind 1967 Ford Mustang Shelby GT500 Super Snake crossed the Mecum auction block in Kissimmee, Florida. The car is the only 1967 Mustang Shelby GT500 Super Snake built with a GT40 Mk II 427 engine. This Super Snake shatters all Ford Mustang GT500 price records just as Ford is about to introduce the all new 2020 Ford Mustang Shelby GT500, at the North American Auto Show, in Detroit. This breaks the record for the most expensive Mustang ever sold at auction. Previously, this same vehicle held the record, selling for $1.3 million, at an Indianapolis Mecum auction in 2013. The famous 1967 GT500 Eleanor Mustang only commanded $1 million when it sold at auction. The Super Snake was never mass produced because the retail price would have been more than twice the price of a GT500 and more than a 427 Cobra. The one-of-a-kind performance Mustang has a storied and well-documented history. According to the information provided to Mecum Auctions, the car was put together specifically for a Goodyear Thunderbolt tire test. The engine was built just for this car. The paint scheme was designed just for this car with a unique Le Mans Blue hood stripe to distinguish the Super Snake from other models. The Super Snake was a rocket, driving 500 miles at an average 142 MPH. Amazingly, the tires retained 97 percent of their original tread. This prototype sold for just $5000! While it has changed hands a few times over the years, the seller still has the Shelby invoice, and Goodyear tire test photos. Carroll Shelby put the racing 427 in the GT500 specifically for the test. The vehicle was originally GT500 no. 544. It was the same powerplant used in the GT40 MkII that had won the famous French endurance race the previous year, including a variation on the MkII’s “bundle of snakes” exhaust system and its 600 HP output. That is what gave the vehicle the “Super Snake” name. The Super Snake was fitted with Shelby 10-spoke aluminum wheels mounted with 7.75-15 Thunderbolt whitewall tires. During the demonstration runs, Shelby reached a top speed of 170 MPH. During the 500-mile test, the drivers drove at 142 MPH average for 500 miles. The test was a complete success. According to Mecum, The Super Snake was then shipped back to Mel Burns Ford in California, where it remained on display while McCain worked to generate interest for a limited run of 50 427-powered GT500s. At over twice the price of a baseline GT500, the Super Snake was priced well beyond its competition, including Shelby’s own 427 Cobra. They were forced to admit the car was “just too expensive”. The Super Snake has been featured a number of times including in the book, “Million Dollar Muscle Cars” by Colin Comer, and in 2013, ownership changed hands to Shelby collector John Wickey, who has fastidiously cared for this illustrious one-of-one Shelby super car for the past five years. 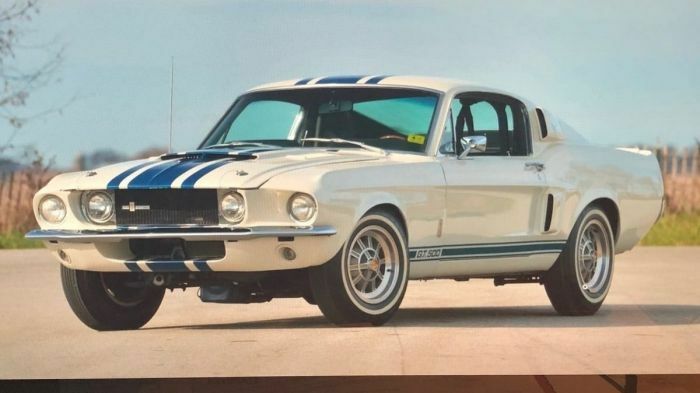 This one-of-a-kind 1967 Ford Mustang Shelby GT500 has a 4-Speed transmission and features the same white and Le Mans blue striping that it wore during its original test run. The Super Snake has a black interior. It was considered a “Main Attraction” for the Mecum Kissimmee Auction that runs January 3-13, 2019. The incredibly rare Shelby Supercar was expected to sell for between $1 and 1.2 million. For more information on the 1967 Ford Mustang Shelby Super Snake click here.